We are proud to announce that ConceptoMed has been named in the Disrupt 100 – a bi-annual Tällt Ventures publication celebrating the businesses with the most potential to influence, change or create new global markets. We were selected from over 1 million global startups and corporate ventures, and judged by global brands including Astra Zeneca, KPMG, IBM and Silicon Valley Bank, tech accelerators Microsoft Ventures, Mass Challenge and WAYRA and entrepreneurs Emma Sinclair, Tom Goodwin and Bill Liao. 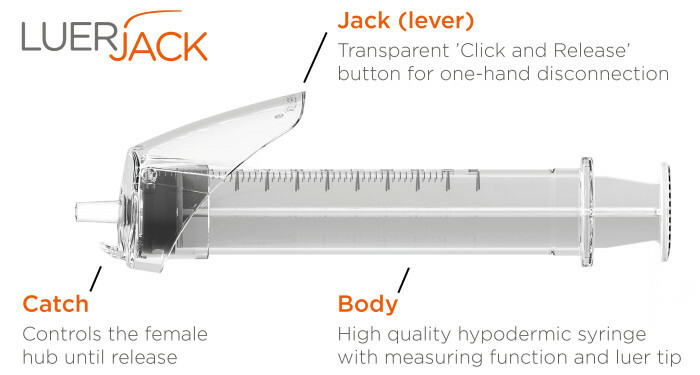 ConceptoMed’s key product, the innovative Luer-Jack syringe, is unique through the very simple one-hand operated disconnection function. Based on the leverage effect, the ‘Click and Release’ feature performs faster, safer and more efficient one-hand disconnections from needles and any other medical luer connections, and thereby reduces the risk of needlestick injuries. Using only one hand safeguards aseptic technique and could become a vital part of the on-going struggle to reduce the occurrence of hospital-acquired-infections. ‘We are proud and humbled to be selected as the only Nordic company recognized by this index. The great potential of the innovative Luer-Jack syringe is not new to us, as healthcare professionals throughout Europe are now starting to use it, however, this is the first time we have been independently celebrated by a global index’, said Christian Mide, M.D., CEO and founder of ConceptoMed. ‘The simplicity of Luer-Jack will make a large footprint in the medical workplace and increase quality of care. From a business standpoint, strong IPR and very low co-innovation risks come from full compatibility of the Luer-Jack technology across existing medical connection standards’, said Mide.